Queen Mother of Reality by Paweł Althamer is a monumental, mixed media sculpture of an elegant figure that is peacefully reclining in the shaded southern section of the park overlooking the East River waterfront. 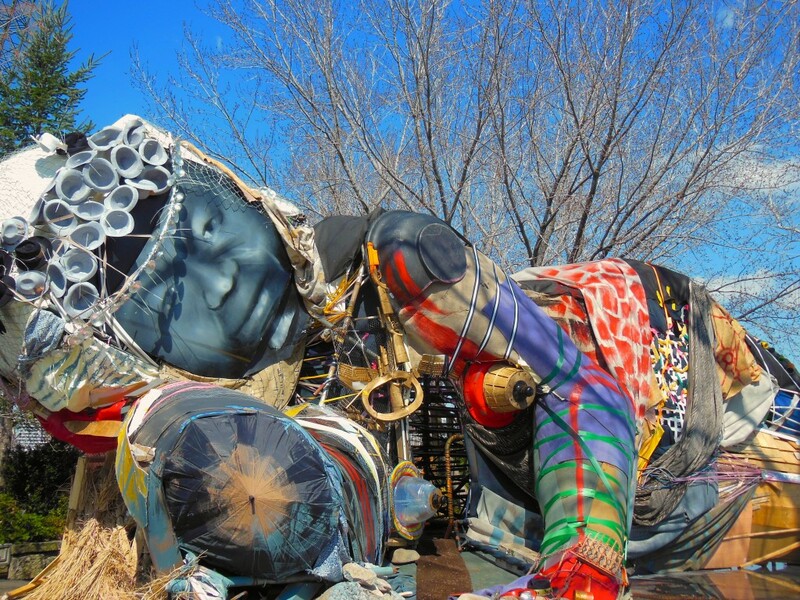 Althamer’s sculpture is dedicated to and inspired by “Queen Mother” Dr. Delois Blakely, a U.S. Ambassador of Goodwill to Africa,who has been the Community Mayor of Harlem since she was sworn in by Mayor Rudolph Giuliani in 1995. Queen Mother of Reality serves as a call to highlight the numerous displaced and homeless of New York City – Dr. Blakely’s paramount cause. Originally built as a part of Althamer’s Performa Commission in 2013, Queen Mother of Reality at Socrates Sculpture Park acts as a platform for creative dialogue and interactive programming, reflecting the park’s commitment to engaging audiences through public art. 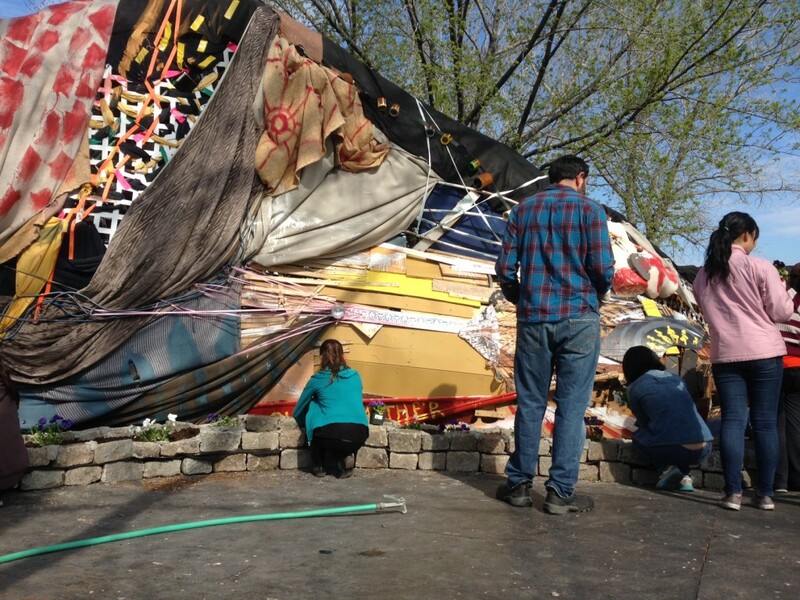 This spring the sculpture was reassembled by Althamer and his collaborators – a team of artists and community members, including artists Noah Fischer, Roman Stańczak, Rafal Zwirek, Jim Costanzo (aka the Aaron Burr Society), Brian Fernandes-Halloran, and Eric Gottshall, as well as the artist’s sons Bruno Althamer and Szymon Althamer. Continuing Althamer’s commitment to social collaboration, which underlines most of his work, Socrates and the artist are programming workshops, events, and talks throughout the summer that invoke Dr. Blakely’s pursuits of social justice and community building. The sculpture is situated in the midst of an active community. The park is surrounded by three of the nation’s largest public housing complexes (Astoria, Ravenswood, and Queensbridge Houses), and the local community has been a park stakeholder since its creation in 1986. 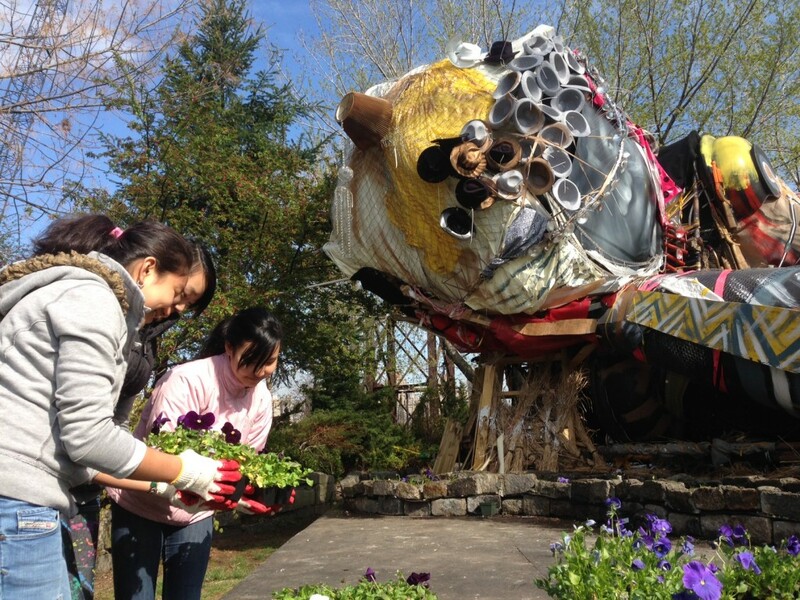 Partnership for Parks and Socrates’ own horticulture team led high school and middle school volunteers as they planted vegetables, herbs, and flowers throughout the Socrates Sculpture Park. The group also designed and planted around Queen Mother of Reality, which remains on view with the sculpture. Artist Brianne Trammel provided free manicures for local mothers from the Astoria Housing Projects inside of her traveling social salon. A tour, lunch and ceremony lead by Queen Mother Delois Blakely with members of the United Nations Forum on Indigenous Peoples. Lead by Queens Action Committee, this delicious event focused on healthy nutrition and the local food landscape through discussions and cooking instructions, alongside Socrates’ weekly Greenmarket. Special art-making workshop for 5th through 8th grade students, that took place in and around Queen Mother of Reality. Inspired by Yoko Ono’s Wish Piece, students were asked to design their wishes and incorporate them into the sculpture, where they remain on view. With the help of the Brooklyn art space Norte Maar, Socrates’ annual Summer Solstice Event became an evening of site-specific sound performances encompassing the entire park. Throughout the evening (the longest of the year) Composers Inside Electronics performed David Tudor’s “Rainforest I.” within Queen Mother of Reality. This workshop was organized around the idea of recycling and seeing the beauty and potential in the everyday waste objects. Participants were encouraged to transform discarded plastic water plastic bottles and caps into colorful works of art. The workshop drew attention to the ways in which the everyday intersects with our creative process and how learning to use fewer materials and creating less waste can enrich our lives. 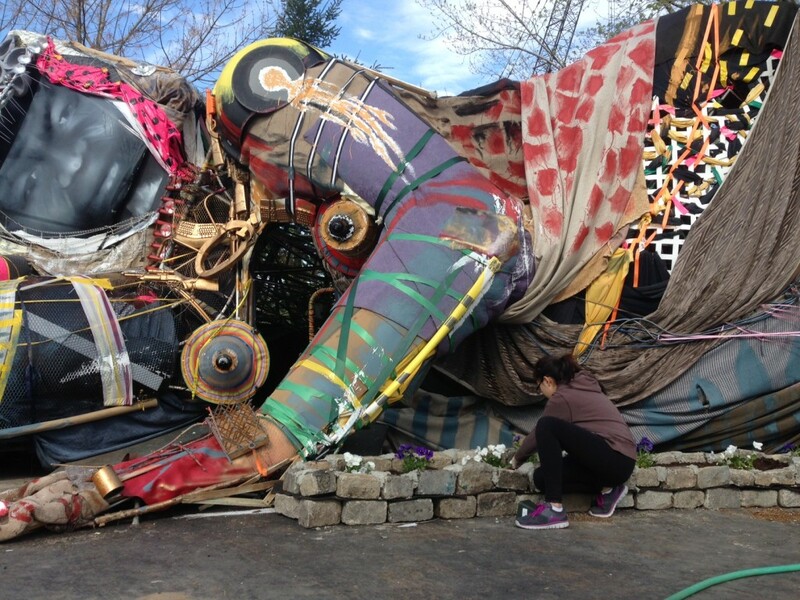 All of the objects created during the workshop were added to the Queen Mother of Reality sculpture by Pawel Althamer at Socrates Sculpture Park. Draftsmen’s Congress at Socrates Sculpture Park was a public gathering where all were invited to join in an open conversation using images instead of words. A Draftsmen’s Congress is the brainchild of visionary Polish artist Pawel Althamer, who introduced this participatory project at the 7th Berlin Biennale, then brought it to the New Museum during his 2014 survey, “The Neighbors.” Throughout the day visitors were worked with the artist to create paintings, collage, and drawings in and around the sculpture. Queen Mother of Reality programming was developed and grew throughout the exhibition. Queen Mother of Reality is presented by Socrates Sculpture Park in collaboration with Performa, and in partnership with the Polish Cultural Institute New York. 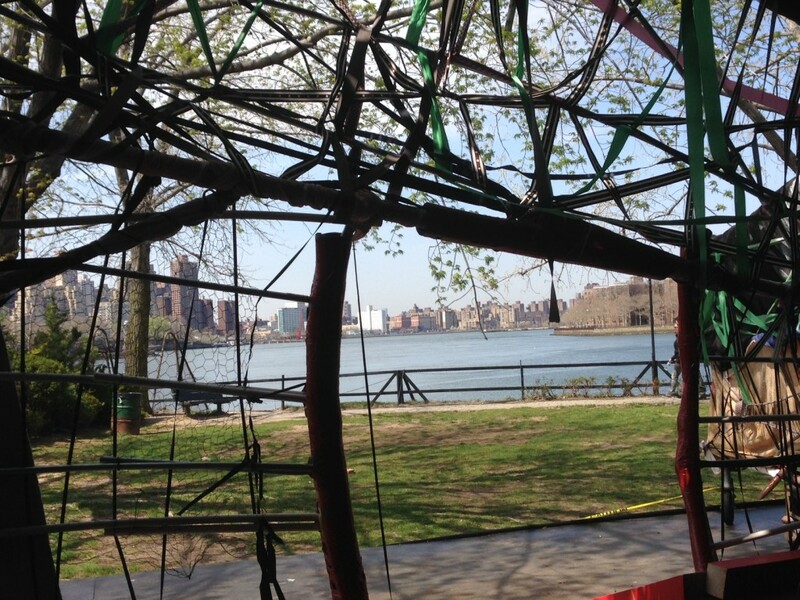 The Exhibition Program at Socrates Sculpture Park is supported by Bloomberg Philanthropies, Charina Endowment Fund, Lambent Foundation, Mark di Suvero, the Maxine and Stuart Frankel Foundation, Agnes Gund, Ivana Mestrovic, and the Thomas W. Smith Foundation. Queen Mother of Reality is a Performa Commission and was originally presented as part of the Polish Pavilion Without Walls for Performa 13. The commission was generously supported by the Andy Warhol Foundation for the Visual Arts, National Endowment for the Arts and Toby Devan Lewis, with additional support from Foksal Gallery Foundation (Warsaw), neugerriemschneider (Berlin), Fundacja Sztuka i Współczesność, CCA Ujazdowski Castle, and Polish Ministry of Cultural and National Heritage, Tilton Gallery.